Liu, Y., Liu, W., Peng, Z., Xiao, Y., Wei, G., Sun, W., He, J. Liu, G. and Chou, C.-L. 2009. Instability of seawater pH in the South China Sea during the mid-late Holocene: Evidence from boron isotopic composition of corals. Geochimica et Cosmochimica Acta 73: 1264-1272. There is much concern that the current and ongoing rise in the atmosphere's CO2 concentration is leading to a significant decrease in the pH of the world's oceans, in response to the ocean's absorption of a large fraction of global anthropogenic CO2 emissions each year. Already, it has been estimated, for example, that global seawater has been acidified by 0.1 pH units relative to pre-industrial times, and model calculations predict an additional 0.7 unit drop by the year 2300 (Caldeira and Wickett, 2003), which decline is hypothesized to cause great harm to marine life, especially calcifying organisms such as corals. But how valid are such claims? Has the 100 ppm rise, or 36% increase, in atmospheric CO2 concentrations truly reduced oceanic pH since pre-industrial times as the models say it has? What role does natural variability play? An intriguing new study sheds some revealing light on such questions. Noting that "seawater pH records that exceed a single decade are not yet available which [time period] is too short to distinguish anthropogenic and natural external forcing and fully understand natural variability of the ocean pH," Liu et al. analyzed the boron isotopic composition (δ11B) of fossil corals in an effort to reconstruct a Holocene history of sea surface pH variations for the South China Sea. 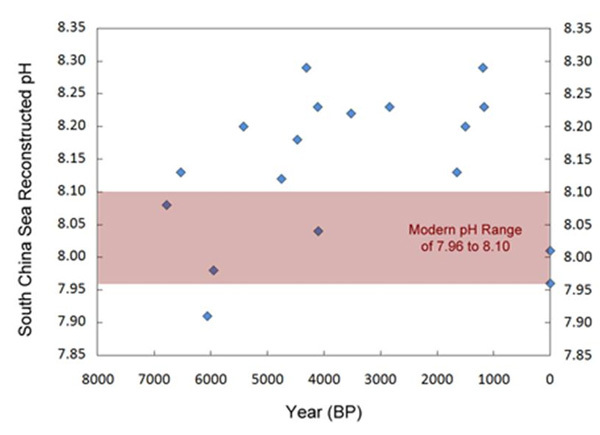 As shown in the accompanying figure, the δ11B-derived pH values for the South China Sea fluctuated between a pH of 7.91 and 8.29 during the past seven thousand years, revealing a large natural fluctuation in this parameter that is nearly four times the 0.1 pH unit decline the acidification alarmists predict should have occurred since pre-industrial times. Given the results presented in the figure above, one cannot reject the possibility that the modern rise in atmospheric CO2 has had no effect on the pH of the South China Sea.